You are currently on the Consulting Terms page of the Vinny Pinto Directory website. Notice: Please be advised that, effective July 10, 2013, Vinny has almost entirely ceased accepting new clients for his consulting and contractual R&D services in the realms of mainstream science and engineering, alternative health, nutrition and also in the realms of strange science/fringe science and alchemy/ormus nutritionals, in order to devote more of his time to his spiritual work. While Vinny will continue to provide consulting and contractual R&D services to certain existing (and past) clients as deemed mutually appropriate, he will be accepting few, if any, new clients for his consulting and contractual R&D services from this point going forward. Vinny has shifted his priorities, as described above, in order to devote more of his time to his spiritual work. This vinnypinto.us website will remain "on the air" (i.e., on the Internet) for ongoing reference purposes and as a service to current and past clients. I insist upon communicating by email, or speaking with, any prospective new clients before we agree to work together, and before the client sends any funds for services, so that we may each assess whether a consulting relationship with me may be of benefit to them at this time. After this brief informal screening and application process, I will advise the client if I am willing and able to work with them on the desired project at this time. For a number of reasons, up until late January 2010, I found it necessary to accept only about 40% of the invitations in the scientific and related realms which I received to perform consulting; the other 60% of solicitations were refused for any of a number of reasons, but the general underlying reason was almost always the fact that I felt that a consulting relationship at that time for that client regarding their current project would not yield maximum value for them, or that it was a project which would feel onerous to me, or that it was a project that I felt was unrealistic or unreasonable in terms of expectations or goals. I ask you to please understand this caveat and bear it in mind if and when you approach me regarding consulting services. And, please understand, as stated clearly above, that from January 31, 2010 onward, I am, and will be, accepting only about two percent of requests for such services -- including lectures, seminars and training -- in the realms of the sciences, fringe science, strange science, nutrition and well-being, and at a significantly increased prepaid hourly rate over my earlier rate. Consulting terms appear below, broken into categories of service. Click on the appropriate category label below to see the associated terms and rates. The following consulting terms and rates apply for all clients in this category with whom I do not have a current contractual relationship with a positive balance of prepaid funds on deposit. The rates listed below in this section apply to most services in the realms of the sciences, fringe sciences, and strange sciences with a few exceptions noted elsewhere on this page. As always, any and all prospective new clients must be pre-approved, and must receive explicit permission from Vinny prior to sending funds. Please be advised that after pre-screening discussions have ended, I typically accepted only 40% of invitations to perform consulting or contractual R&D services prior to January 31, 2010, and that I will be accepting and approving, at most, only two percent of requests for such consulting services from January 31, 2010 onward; please see my January 31, 2010 letter for further details. Please note that all contractual R&D and consulting services are offered on a prepaid basis only. My base prepaid hourly rate is $1,250 per hour (it was raised to this level in April of 2018 after having held steady at $950/hr for over 6 years), for those rare applicants who are accepted for my services. Please do not send ANY prepaid fees until you have first received permission from Vinny to proceed with payment, as Vinny only accepts a small percentage of prospective clients for consulting services. All prepaid fees may be used at any time for 4 years after date of receipt of cleared payment. There are no refunds or returns allowed on any prepaid fees, regardless of whether or not they are used in full. If you are a new prospective client, or an old client approaching me with an entirely new project, or an old client wishing to perhaps replenish prepaid funds on deposit with me, please do not send any funds to me until and unless you have reviewed the section above entitled A Note to All Prospective Clients and we have performed the requisite steps prior to proceeding. Thanks! Prepaid consulting fees are not refundable or returnable, but be advised that prepaid time may be used over the ensuing four years from date of cleared payment. If you purchase a block of one hour or longer prepaid, there is no need to use all the time in one block (i.e., in one phone call or one project.) All prepaid time of one hour and up may be used incrementally over multiple calls and/or services spanning the next 4 years after receipt of cleared funds. All fees may be prepaid using one payment methods listed on the Payments page. Once approved for consulting work with me, you may prepay for anywhere from 1 hour to as much as 400 hours of time. On-site consulting and training services may warrant a somewhat different rate, plus travel expenses. In all cases, my work for pre-screened and pre-approved clients will only start once I have received cleared funds as prepayment for a block of my time. If you are contemplating paying by check, please realize that even after I have deposited a check in the bank, there will usually be a delay of an additional 5 to 15 or more days for the funds to clear. As of June 1, 2007, and until further notice, please see the terms and fee schedule listed in the section above, in the section entitled Terms for Consulting and Contractual R&D Services in the Sciences, Fringe Science and Strange Science Realms. The same terms and rates apply for this category. All fees may be prepaid using one of the payment methods listed on the Payments page. With the above caveat about my limited availability in mind, if you remain interested in my services for lecturing, seminars or in-house training in the realms of science, fringe science, strange science, nutrition or well-being, then please contact me via email or phone so that we may discover if we might work well together. If we decide that such a project might be a "go", then I will send you some basic information on possibilities, terms and rates via email, and also on my availability within the time windows in which you are interested. As is true with all my work in these fields, for all seminars, trainings and lectures, I must receive prepayment for the full lecture fee and for all per-diem expenses, travel expenses, and hotel/meal expenses at least four weeks in advance of the booking date. Please understand that, for various reasons, prior to January 31, 2010, I tended to accept only about 10% of invitations to deliver lectures or seminars. From January 31, 2010 and onward, I will be accepting even far fewer invitations to render services in this realm. If and when I agree to accept a lecture or seminar venue, all fees may be prepaid using one of payment methods listed on the Payments page. The following consulting terms and rates apply for all clients with whom I do not have a current contractual retainer-based relationship, and reflect my terms and rates for consulting services based primarily upon intuition, aka inner guidance. Personally, I feel that all of my consulting work, including that rendered in scientific and agricultural fields, involves the use of intuition to some degree. However, I have found over the past five years that more and more, some clients have been approaching me where their explicit interest is in consulting services which are based primarily upon my inner intuitive guidance, that is, where I enter a very deep meditative state and acquire answers or guidance based primarily upon intuition, aka inner guidance, which is also sometimes known as guidance from Holy Spirit. This category of consulting services has been created to address the needs of those clients. All new clients must be pre-approved and receive permission from Vinny prior to sending funds. Please be advised that after pre-screening discussions have ended, I typically accept only 30% of invitations to perform intuitive consulting services. My base prepaid hourly rate is $1,250 per hour (it was raised to this level in April of 2018 after having held steady at $950/hr for over 6 years), for those rare applicants who are accepted for my services; all fees must be prepaid. Please do not send ANY prepaid fees until you have first received permission from Vinny to proceed with payment, as Vinny only accepts a small percentage of prospective clients for intuitive consulting services. All prepaid fees may be used at any time for 4 years after date of receipt of cleared payment. There are no refunds or returns allowed on any prepaid fees, regardless of whether or not they are used in full. If you are a new prospective client, or an old client approaching me with an entirely new project, please do not send any funds until and unless you have reviewed the section above entitled A Note to All Prospective Clients and we have performed the requisite steps prior to proceeding. Thanks! All fees may be prepaid using one of the payment methods listed on the Payments page. For example, a typical caller may estimate that their call will likely take just under 50 minutes, which rounds up to a one hour block of time, for a total of $1,250 (which would be prepaid only after having received my approval). Alternatively, a client who wishes a long-term relationship might choose to prepay $12,500 for 10 hours for a block of time to be applied toward ongoing spiritual coaching services, and would send those prepaid funds only after having received approval from me. All rates cited above are for intuitive consulting in any realm, including commercial, industrial, scientific, nutritional, etc., that is, consulting in any realm or field which is primarily based upon my ability to access intuitive guidance, aka inner guidance. If you purchase a block of one hour or longer prepaid, there is no need to use all the time in one block (i.e., in one phone call or one project.) All prepaid time of one hour and up may be used incrementally over multiple calls and/or services spanning the next 4 years. In all cases, my work will only start once I have received cleared funds as prepayment for a block of my time. If you are contemplating paying by check, please realize that even after I have deposited a check in the bank, there will usually be a delay of an additional 5 to 15 or more days for the funds to clear. Please note that spiritual coaching is very much different from spiritual healing; Vinny's spiritual healing services are offered via a dedicated website. The following terms and rates for spiritual coaching apply for all spiritual coaching clients with whom I do not have a current contractual retainer-based relationship, and reflect my terms and rates for spiritual coaching services. All candidates applying for spiritual coaching services must have experienced at least one full spiritual healing session (please see my spiritual healing website for more details) with me. And, all candidates applying for spiritual coaching services must also spend about five minutes on the phone with me in a pre-screening call. Please be advised that after pre-screening discussions have ended, I typically accept only 10% of requests to provide spiritual coaching services. My spiritual coaching services, with no exceptions, are offered on a prepaid fee basis only. Prepaid spiritual coaching fees are not refundable or returnable, but be advised that prepaid time may be used over the ensuing four years from date of receipt of cleared payment. All rates quoted for services are based upon prepayment of services in advance. Clients are asked to prepay in advance for all services. My spiritual coaching services are billable in one hour blocks, prepaid. My base prepaid hourly rate is $1,250 per hour (it was raised to this level in April of 2018 after having held steady at $950/hr for over 6 years), for those rare applicants who are accepted for my services. All blocks are billed in one hour increments with a one hour minimum block size for spiritual coaching services. If you are a new prospective spiritual coaching client, or an old client approaching me with an entirely new issue/focus, please do not send any prepaid funds until and unless you have reviewed the notes which appear earlier in this section, and until we have performed the requisite steps (i.e. my approval) prior to proceeding. Thanks! On-site spiritual coaching services may warrant a somewhat different rate, and will also invoke coverage of travel expenses, etc. If you purchase (with my prior approval) a prepaid block of time of one hour or longer, there is no need to use all the time in one block (i.e., in one phone call or one project.) All prepaid time of one hour and up may be used incrementally over multiple calls and/or services spanning the next 4 years. Note: If you are a new prospective client, or an old client approaching me with an entirely new project, please do not send any funds until and unless you have reviewed the section above entitled A Note to All Prospective Clients and we have performed the requisite steps prior to proceeding. Thanks! 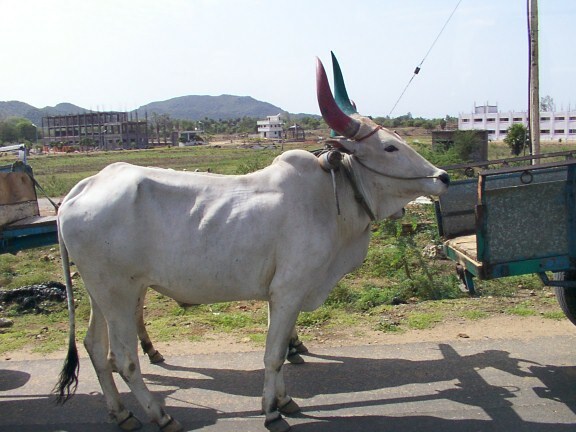 The photo above shows water buffalo pulling a cart at the side of National Highway 45 just southwest of Chennai, India. I shot this photo in September 2005 while on a 3+ week consulting tour on behalf of several clients in southern India. A privacy notice, about the Traffic Analyzer for this web site and privacy. Counters added 02/19/2019 at zero. All of our web pages load quickly and easily. No fancy graphics, no banners, no annoying ads, no Java applets, no sound, no animations, no time-wasters!